FROM HUMBLE BEGINNINGS: A true success story, Ryan Speedo Green makes his recital début in the Nation’s Capital. 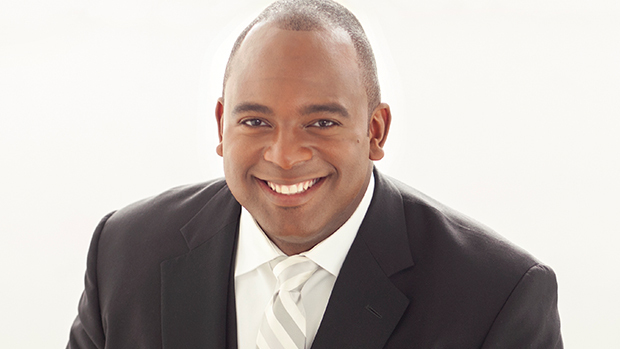 Virginia native Ryan Speedo Green will be presented in recital as the 2018 Marian Anderson Award recipient at The Kennedy Center on Thursday, October 4, 7:30 p.m. in The Terrace Theater. From his time during his youth spent in juvenile detention to the Metropolitan Opera and other great stages of the world, Green will perform here in Washington, D.C. His program will feature works by Wagner, Verdi, and Mahler as well as the American composers Margaret Bonds, Florence B. Price, Leslie Adams, and Howard Swanson. Green will be accompanied by pianist Adam Nielsen. “In addition to the recital co-presented by Washington National Opera and the Kennedy Center’s Fortas Chamber Music Concerts, Green received a $10,000 cash prize and will lead a master class with students in the Vocal Music program at the Duke Ellington School of the Arts, Washington D.C.’s visual and performing arts high school. Green was selected by a distinguished panel comprising Evans Mirageas (Artistic Director Cincinnati Opera and Atlanta Symphony Orchestra), Michael Heaston (now Music Director-HGO Studio at Houston Grand Opera and Director of Opera Studies at Rice University), Francesca Zambello (WNO Artistic Director), Andrew Jorgensen (now General Director of Opera Theatre of Saint Louis), director Tazewell Thompson (Lost In The Stars and Appomattox at WNO), mezzo-soprano and former Marian Anderson Prize winner Denyce Graves, and soprano and Kennedy Center Honoree Martina Arroyo” stated in a recent press release. Previous award recipients include Sylvia McNair, Denyce Graves, Philip Zawisza, Nancy Maultsby, Patricia Racette, Michelle DeYoung, Nathan Gunn, Marguerite Krull, Eric Owens, Lawrence Brownlee, Indira Mahajan, Sasha Cooke, J’nai Bridges, Jamie Barton, Janai Brugger, and most recently, counter-tenor John Holliday. Tickets are $39 and are available online, in person at the Kennedy Center Box Office, and by calling (202) 467-4600 or (800) 444-1324. Groups of 10 or more may contact the Kennedy Center Group Sales office at (202) 416-8400. For all other ticket-related customer service inquiries, call the Advance Sales Box Office at (202) 416-8540.